So, I was on Cravendale milk website the other day, seeing if they supply facts to their consumers about what really goes in to the cows milk they steal and bottle. I was messing around on their site, looking at the frequently asked questions trying to find anything about the cows they imprison and forcibly impregnate, the resulting calves and the number of somatic (pus) cells in each litre. Funnily enough I didn’t see anything relating to this so I asked the following questions. Fair enough questions I think. If a consumer was to ask those question I don’t think there is any reason why they shouldn’t answer right? Hmm, but they didn’t really answer my questions, only seemed to want to answer one about female calves. Even then they were a little cagey with the answer, they did hint that the baby is taken away from the mother and reared in bespoke rearing facilities. Obviously, I don’t have any pictures of the facilities employed by Cravendale or the 2700+ dairies that part own Arla. 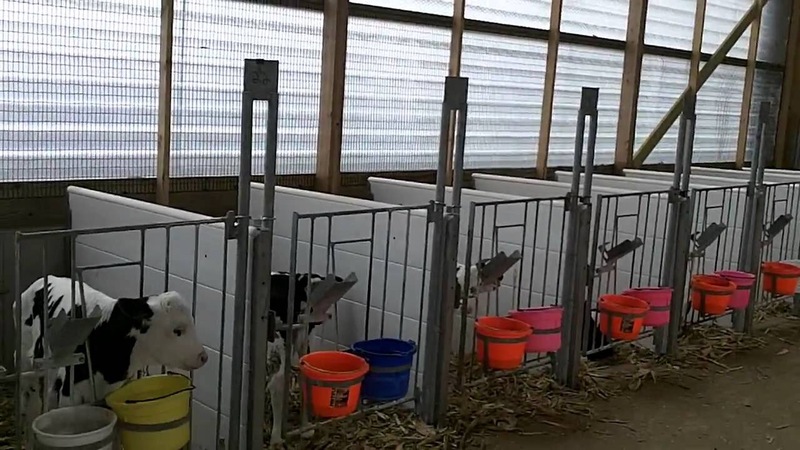 But below is a picture of a typical calf rearing facility. Isolated in individual pens, fed from a bucket with little to no enrichment activities. So, the baby cow is taken from its mother, put into a pen on its own and fed from a bucket. If we take a look at what cows milk is and what it is for, the clue is in the name. Cows Milk ——> Milk for Cows. It is to turn a 65lb calf into a 400lb cow. I think I have a good idea of what the answers are, whether Cravendale actually want to respond with the truth or whether they ignore me is another question I am pretty sure I know the answer to. What I would say is, if you want to know the answers please feel free to ask them too. Surely if enough people ask, it will become a frequently asked question and they will put it on their website? No, I didn’t think so either. Because no matter how they spin it saying that male calves are killed, female calves are separated from their mothers, each litre of cows milk can have up to 400,000,000 (4oo million) Somatic (pus) cells in it, that dairy cows dont make it to half of the life expectancy they should get to before they are killed and slaughtered and that they are forcibly inseminated just wont be good advertising. The fact they aren’t proud enough of their business to be able to confidently answer the questions or to just straight up ignore follow up messages speaks volumes. If you are doing something you aren’t proud enough to talk about, especially when what you are doing is being sold for profit to a huge consumer base, tells me that you shouldn’t be doing it. 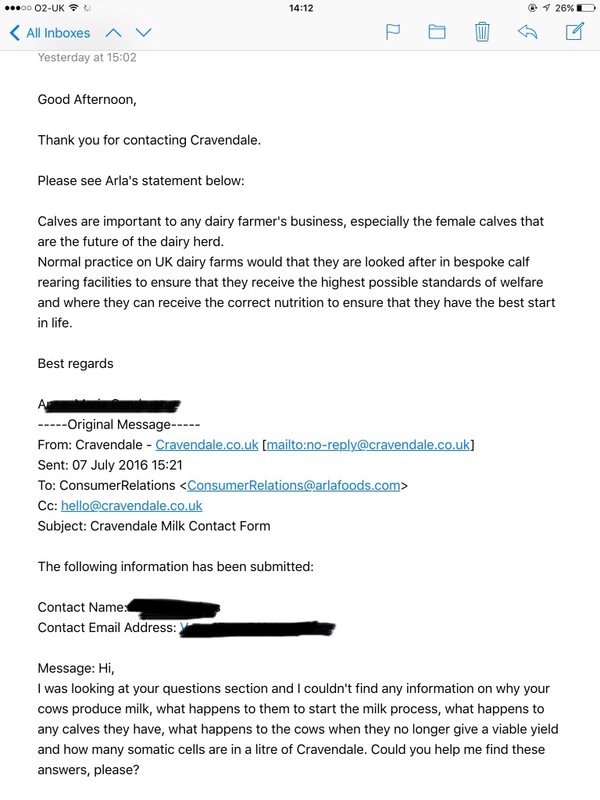 So I will ask myself the questions and answer them with a typical answer from the dairy industry, if they dont apply to Cravendale, well, I have asked them direct and had no response. What happens to Male Calves? Usually, taken from their mothers and either killed with a bolt to the head straight away or auctioned for Veal. usually leading to their throats being slit and bled out before being slaughtered for meat. What happens to a cow when the milk yield decreases? What age ado cows keep being milked to? The normal and average life expectancy of a cow is from between 15 and 20 years. The modern dairy cow can expect to live for 6.5 years with an average of four lactations (the process by which milk is produced). How many somatic cells per litre of Cravendale? Firstly, I should define what Somatic Cells are, so here is a definition taken from AHDB dairy. The Somatic Cell Count (SCC) is a main indicator of milk quality. The majority of somatic cells are leukocytes (white blood cells) – which become present in increasing numbers in milk usually as an immune response to a mastitis-causing pathogen – and a small number of epithelial cells, which are milk-producing cells shed from inside of the udder when an infection occurs. Gross. Somatic cells, more commonly known as pus cells, are counted in milk sold for human consumption as there are legal limits as to how much it can contain. Somatic cells are the white blood cells that are the defence against bacteria that invade the udder and can cause mastitis. Cows’ milk can legally contain up to 400 million pus cells/litre. So one teaspoonful of milk can legally have two million pus cells! Cravendale say their filter the cows milk they sell, so I cannot say for sure how many cells remain. When the calves are looked after in their bespoke rearing facility are they separated from their mother? If so, at what age? Yes. Simply, yes. They are taken from their mothers because the milk they would usually suckle on for 9 months is taken from them and bottled. They are usually stolen from their mother with in 2 days. Do they receive the “correct nutrition” from their mothers milk? NO. They may get lucky in that they will be able to suckle for those first 2 days but after that its a concoction made by the dairy farm and “vet”. Humane Slaughter. The Worst Lies We Tell….